What Else Can I Expect From an Online Associate in Early Childhood Education Program? 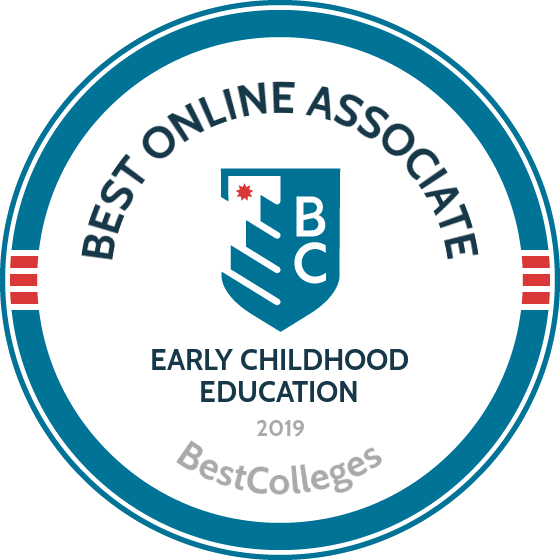 What Are The Best Online Associate in Early Childhood Education Programs? An associate degree in early childhood education prepares you for a career working with young children and their families. Many school districts across the country are implementing kindergarten programs for four-year-old children, and the National Center for Education Statistics reports that more than one million children are enrolled in pre-K programs nationwide. An associate degree in early childhood education allows you to teach in a preschool setting. The Bureau of Labor Statistics (BLS) projects that the early childhood education field will have an employment increase of 10% between 2016 and 2026, which is above the national average. What Can I Expect From an Online Associate in Early Childhood Education Program? An early childhood education online associate degree can be completed in one or two years and requires students to earn around 60 credits. Students will encounter courses in child growth and development, language development, child safety, and more. Many early childhood education online programs offer concentrations for students to choose between, which may include special education, child advocacy, and childhood nutrition. Liberty University began in 1971 as Lynchburg Baptist College with 154 students. Just five years later, the school was renamed Liberty Baptist College and in 1985 it became Liberty University. The precursor of the school's current online branch -- Liberty University Online -- started offering distance learning courses in the same year. Liberty University Online offers an early childhood education associate degree online through the school of education. The program comprises 60 credits and students can earn the degree without any campus visits. Liberty University's online associate degree in early childhood education does not lead to licensure. Students typically graduate from the program within two years. The university offers a generous transfer credit policy. Students can transfer up to 75% of the degree credits as long as they earned the credits from an accredited program or institution. The early childhood education online associate degree, however, requires students to complete at least 50% of courses in the major at Liberty University. The curriculum includes classes in educational policy, learning theory and portfolio development, psychology of childhood, and education philosophy. The program does not require students to undergo a practicum experience. Chartered in 1971, Stanly Community College is part of the North Carolina Community College System. The two-year college began with eight instructors, 31 students, and programs in air conditioning and refrigeration, auto mechanics, business, industrial management, and secretarial science. Stanly Community College now enrolls over 3,500 students in its curriculum programs and close to 7,000 students in its non-curriculum programs. The college offers an associate degree in early childhood education online that comprises 64 credits. The program offers three tracks: transfer birth - kindergarten licensure; transfer non-licensure; and career ready. The first two tracks lead to degrees that transfer to 12 public universities. The college also holds articulation agreements with three private colleges that accept graduates of either of these two tracks into their early childhood education bachelor's programs. The career-ready track does not transfer to a four-year bachelor's program. Graduates receive an associate in applied science degree in early childhood education. Stanly Community College's AAS in early childhood education holds accreditation from the National Association for the Education of Young Children. The curriculum includes coursework on topics such as early childhood administration; foundations of education and teacher licensure preparation; child guidance; health, safety, and nutrition; and child, family, and community. Students must complete a capstone practicum to graduate from the program. The University of Alaska Fairbanks began in 1922 as the Alaska Agricultural College and School of Mines. Six teachers taught 16 classes to six students. Today, the university hosts close to 9,000 undergraduate and graduate students. The university holds accreditation from the Northwest Commission on Colleges and Universities. The University of Alaska Fairbanks eCampus offers an early childhood education associate degree online that students can pursue without any campus visits. Graduates receive an associate of applied science degree in early childhood education. The program consists of 60 credits and includes courses in child development; foundations in nutrition and physical wellness; safe, healthy learning environments; and inclusion of children with special needs. The program includes a practicum component that all students must complete to earn the degree. Online courses follow an asynchronous delivery format, enabling students to access course materials at any time and from anywhere. The university charges online students the same tuition as Alaska residents, regardless of where they live; however, online students pay additional technology, network, and eCampus fees. Founded in 1819, the University of Cincinnati began with 70 students and a three-member faculty. Today, the university hosts over 46,000 students and offers undergraduate and graduate degrees in diverse disciplines, including business, engineering, fine arts, law, and medicine. The school holds accreditation from the Higher Learning Commission. UC offers an early childhood education associate degree online through the School of Education, Criminal Justice, and Human Services. Students typically graduate in two years without any campus visits. Courses follow an asynchronous delivery format. The university's early childhood education program focuses on working with young children and families from different cultures and socioeconomic backgrounds. The program consists of 60 credits and offers three concentrations: administration; infant and toddler care education; and preschool care and education. Students complete 45 credits of core coursework and 15 credits in their concentration. The core curriculum includes courses in educational technology; health, safety, and nutrition; educational psychology; and families, communities, and schools. Students must maintain at least a 2.5 GPA in their concentration courses to earn the degree. The school assigns an adviser to every online student prior to enrollment to assist with registration and provide general guidance. UC's early childhood education program holds accreditation from the Council for the Accreditation of Educator Preparation. Established in 1923 as the Iola Junior College, Allen Community College was primarily an extension of the district's high school. In 1965, the school's name was changed to Allen County Community Junior College, signifying its expansion and diversification of degree offerings. The name was shortened to Allen Community College in 1980. Allen Community College holds accreditation from the Higher Learning Commission. The college offers an associate of arts degree with an emphasis in early childhood education. Students can complete the 64 credit program in four semesters of full-time enrollment. Learners may earn the degree entirely online or through a combination of online and onsite classes. Required coursework covers topics such as principles of early childhood, developmental psychology, and early childhood growth and development. Many graduates of the early childhood education program pursue a bachelor's degree at partner institutions, including Kansas State University, Pittsburg State University, and Washburn University. Online students pay a technology fee of $25 per credit hour. Learners enjoy access to the Online Student Resource Center where they can download course schedules, get technical support, and access school resources. Online courses follow an asynchronous delivery format with an eight-week delivery schedule. Founded in 1967, Montgomery Community College was accredited by the North Carolina State Board of Education Department of Community Colleges and the Southern Association of Colleges and Schools in 1978. Montco offers a 61-credit associate degree in early childhood education online accredited by the National Association for the Education of Young Children. Most students graduate from the program after two years of full-time enrollment. The program focuses on child development and education from birth through fourth grade. Students can complete most program requirements without visiting campus. Students take 25 general education credits and 36 credits in the major. Core coursework includes classes in teaching young children; connecting families, schools, and communities; early childhood curriculum; and working with children with special needs. Students gain hands-on classroom experience as student teachers, which accounts for six credits of major coursework. Students must also enroll in an aesthetic sensibility elective and a scientific reasoning elective, each comprising three credits. Montco's early childhood education program requires a criminal background check and CPR certification. Randolph Community College began as the Randolph Industrial Education Center in 1962 with 75 students. The college currently enrolls more than 3,700 degree-seeking students in addition to over 9,000 non-credit students enrolled in continuing education classes. Randolph Community College holds accreditation from the Southern Association of Colleges and Schools Commission on Colleges. The college offers an early childhood education associate degree online that prepares students to work with children from birth to age eight. The degree comprises 69-70 credits and includes some on-campus components. The school offers licensure and non-licensure tracks. Students who complete the AAS program in early childhood education can transfer to any public higher education institution, private college, or university in North Carolina that endorses the Comprehensive Articulation Agreement or the Independent Comprehensive Articulation Agreement as a third-year student. Students pursuing the AAS degree in early childhood education enroll in classes in early childhood administration; children, family and community; curriculum planning; school-age development and program; and child development. The program requires students to complete a capstone practicum in an early childhood education environment accredited by the National Association for the Education of Young Children. Founded in 1993, South Texas College currently has six campuses, a virtual campus, and two higher education centers. It is the only community college in the Lone Star State offering four-year baccalaureate degrees in addition to certificate programs and associate degrees. South Texas College offers an associate of arts in teaching degree with tracks in elementary, middle, and high school education. The program focuses on the teaching profession and introduces students to teaching principles and practice, curriculum development, and student management. The college offers some courses in the AAT in elementary education 4-8 generalist online. The degree comprises 60 credits, 42 of which must consist of core curriculum coursework. Students enroll in introductory classes in special populations and the teaching profession in addition to courses in physical science, mathematics, art appreciation, composition, and U.S. history. The program gives students the opportunity to observe real classrooms in district public schools. South Texas College maintains well-established transfer opportunities with several colleges and universities within the state and throughout the country. Students who complete the associate degree can transfer their credits towards a four-year bachelor's degree at several accredited higher learning institutions, including Texas A&M University, Georgetown University, and Colorado State University - Global Campus. Established in 1964, Richmond Community College belongs to the North Carolina Community College System, which comprises 58 public community colleges throughout the Tar Heel State. With an enrollment of 710,000 students, the North Carolina Community College system ranks as the third-largest community college system in the country. Richmond Community College hosts just over 3,000 undergraduates. It holds accreditation from the Southern Association of Colleges and Schools Commission on Colleges. Richmond Community College offers an early childhood education associate degree online that consists of 71 credits and typically takes two years of full-time enrollment to complete. The program prepares students to work with children from birth to age eight. The curriculum includes courses in child development; early childhood administration; children with exceptionalities; health, safety, and nutrition; and child, family, and community. Students must complete an early childhood education capstone practicum at a preschool or early childhood learning center accredited by the National Association for the Education of Young Children or the National Association of Child Care Resource and Referral Agencies. Richmond Community College maintains transfer pathways to all four-year higher education institutions in the University of North Carolina system in addition to 20 other private and public universities in the state. The North Carolina University System guarantees admission to one of its institutions for Richmond graduates with a 2.0 GPA or higher. Based in Dobson, North Carolina, Surry Community College enrolls more than 3,000 students annually. Along with a distance education program, the college operates satellite campuses in Mount Airy, Elkin, Pilot Mountain, and Yadkinville. Distance learners enjoy a flexible delivery format that includes fully online and hybrid options. The school also offers a variety of support services, including career counseling, tutoring, academic advising, disability support, and veterans' affairs. The associate in early childhood education program trains candidates to work with young children under teacher supervision, assisting in the development of cognitive/language skills, creativity, emotional/social intelligence, and physical motor skills. Candidates pursuing the early childhood education associate degree online complete a minimum of 67 credits. The curriculum includes courses in health, safety, and nutrition; child guidance; children with exceptionalities; and infants, toddlers, and twos. During the final semester, all candidates complete an early childhood capstone practicum, applying program principles to professional practice in an early childhood classroom environment. Working under close supervision, practicum participants design, implement, and evaluate activities to encourage student learning. The practicum emphasizes practical skills and competencies, including appropriate planning and assessment strategies, child guidance techniques, and ethical behavior. Two years after it was founded in 1967 as Elko Community College, Great Basin College joined the University of Nevada System of Higher Education. The school enrolls close to 4,000 students online and on campus and holds accreditation from the Northwest Commission on Colleges and Universities. Great Basin College offers an associate degree in early childhood education online that comprises at least 60.5 credits. Students typically graduate after two years of full-time enrollment. The program gives students the necessary skills to work with young children and their families in a variety of educational settings. Students can complete the program without any campus visits. GBC charges online non-resident students a slightly higher tuition rate than resident students. Students take 36.5 general education credits and 24 core credits. The early childhood education curriculum includes classes in child development and education, early language and literacy development, principles of child guidance, and cross-cultural awareness and professional behavior. The program requires students to complete a preschool practicum comprising six credits. Advisers work with online students to locate local schools to fulfill the practicum requirement. Students graduate with an associate of applied science degree in early childhood education. Founded in 1878 as the Georgia Baptist Female Seminary, Brenau University became Brenau College in 1900 before achieving university status in 1992 and taking on its current name. Although the school began accepting male enrollees in 1972, its current student population remains predominantly female at 87.4%. Brenau University holds accreditation from the Southern Association of Colleges and Schools Commission on Colleges. U.S. News & World Report ranks the university as 47th in the Best Regional Universities South Rankings. Brenau began offering online programs in 1998 and currently offers an online associate of arts degree in elementary education. The program consists of 61 credits and includes courses in world and U.S. history, communication and language fluency, art appreciation, and mathematics. Students also take introductory courses in teacher education, multicultural education, and developmental psychology. Most students earn the degree after two years of full-time enrollment. The program contains a field experience component that online students can pursue locally after consulting with an adviser. The program also includes a residency requirement. College Level Examination Program units or experiential credits do not count towards the residency requirement. The elementary education degree fulfills general education requirements and elementary education prerequisites for a bachelor's degree in elementary education. Students must earn at least 25% of the degree requirements while enrolled at the university. Students can transfer up to 45 credits toward the degree. Located in Bolivia, North Carolina, Brunswick Community College primarily serves the population in and around the titular Brunswick and New Hanover counties. BCC also operates auxiliary campuses throughout Brunswick County in Carolina Shores, Southport, and Leland. In recent years, the school expanded its distance learning offerings, allowing it to reach students around the nation. BCC now offers an early childhood education associate degree online. The online early childhood education program at BCC ultimately awards an associate in applied science degree. The program requires students to complete 76 credits to graduate, a process that usually takes two years (or four semesters) of full-time study. Like most associate degrees, the curriculum combines general education requirements, such as study skills and expository writing, with field-specific coursework. Notable early childhood education-related courses include early childhood administration, educational technology, advanced issues in early childhood education, and lab courses in math and creative activities. All students also complete a capstone practicum experience to build valuable hands-on experience in childhood education. As the majority of BCC's online students continue to work or raise a family, the program aims for flexibility by delivering all of its coursework asynchronously and eschewing on-campus requirements. Like most community colleges, BCC maintains an open enrollment policy, and all applicants need only submit evidence of a high school diploma or GED to earn admission to the program. Upon graduating, students can find work in head start centers and preschools or pursue a bachelor’s in early childhood education. Operating several campuses across America's Dairyland, with locations in Ladysmith, Ashland, Superior, Rice Lake, Hayward, and New Richmond, Wisconsin Indianhead Technical College primarily focuses on career preparation programs for students in the area. In recent years, the school has extended its presence to students across the nation through distance learning. As such, students from all states can now complete WITC's career-focused associate's degree in early childhood education online. The online early childhood education program at WITC consists of two main elements: asynchronous online coursework and student teaching at schools in each online student's local community. As such, the program provides flexibility to working professionals, who make up the majority of the student body. WITC’s program uses a blended learning format, as students must visit campus once a week to attend class. Students may participate in optional teaching labs on campus as well. The program generally takes two years to complete and includes noteworthy courses, such as curriculum planning; infant and toddler development; art, music, and language arts; guiding children's behavior; and children with differing abilities. The curriculum also includes a two-part practicum experience that ensures that students gain hands-on experience in the field. WITC maintains an open enrollment policy, so students interested in the program need to submit evidence of a high school diploma or GED. All applicants must also pass a background check before enrollment, due to the student teaching component. Located in Henderson, North Carolina, Vance-Granville Community College primarily serves the student population in and around the titular Vance and Granville counties, but also incorporates students from nearby Franklin and Warren counties. Originally opening as a technical institute in the 1960s, VGCC maintains a focus on career education for working professionals to this day. The college also furthers that mission by offering several programs through distance learning, including the best online early childhood education associate degree program in the area. The online early childhood education program at VGCC requires students to complete 69 credits to graduate. Students usually complete the program within two years, or four semesters, of full-time study. A blended learning model combines asynchronous online coursework with significant on-campus course requirements. Students can choose between courses offered on campus in the day or the evening, providing flexibility for working professionals. Noteworthy courses include music, movement, and language; developmental psychology; observation and assessment in early childhood education; and education technology. Students complete a capstone practicum experience and a field experience in language and literacy. As a community college, VGCC offers open enrollment. As such, applicants need only submit evidence of a completed high school education through a diploma or GED. All prospective students must also pass a criminal background check. Located nearby the Dallas/Fort Worth area in the city of Waxahachie, Texas, Southwestern Assemblies of God University originally opened its doors in the 1920s as the result of a merger between three separate Bible schools. Since then, the school has continuously expanded its scope, beginning to offer degrees in the liberal arts, behavioral sciences, and business. SAGU excels in distance learning and offers many of its strongest programs online, including an early childhood education online degree associate program. SAGU's online early childhood education program stands out among its peers thanks to its flexibility. The program delivers all of its coursework asynchronously and never requires students to visit campus in Waxahachie for any reason. Nevertheless, the program does not sacrifice individual attention and close student/faculty relations, as SAGU limits the number of students in each class. Topics in the curriculum include foundational areas, such as classroom management, curriculum design, differentiating instruction, and assessment. All online students gain access to SAGU's wellness and career services. As a private university, SAGU does not distinguish between Texas residents and out-of-state online students for tuition purposes. Unlike some peer programs, SAGU's elementary education degree includes coursework on Christianity and prepares students to teach in Christian-affiliated private and public schools. A Roman Catholic, Marianist-affiliated university based in the Kaimuki neighborhood of Honolulu, Hawaii, Chaminade offers strong programs across various disciplines, including religion, criminal justice, business, and biology. The school also excels in education and now offers one of its best teaching programs -- an early childhood education online degree associate program -- without any on-campus requirements. The online early childhood education associate program at Chaminade requires students to complete 60 credits, a process that usually takes four semesters (two years) of full-time study. Unlike some of its peers, Chaminade never requires students to visit campus to earn their degree, delivering all coursework in the early childhood education program asynchronously. Notable core courses in the curriculum include a two-part introductory study in early childhood education; health and family issues in early childhood education; and music, art, and creative movement in early childhood education. All students in the program also complete a practicum experience at an arranged school in their local community. Students must complete a psychology course in child development before enrolling in any major coursework. Chaminade does not list any minimum GPA or standardized test requirements for admission to the program. Students interested in pursuing a bachelor's degree in early childhood education can seamlessly transition to Chaminade's bachelor's program, provided they earn a minimum cumulative 2.0 GPA during the associate program. Operating campuses throughout northeast Nebraska in Norfolk, West Point, Sioux City, and O'Neill, Northeast Community College originally opened its doors in the 1970s as the result of a merger between two other community/technical colleges. Though primarily a regional school, Northeast has expanded its distance learning programs in recent years, allowing it to reach students across the country. Northeast now offers some of its best programs through distance learning, including an early childhood education associate degree online. Northeast's 60-credit online associate program in early childhood education enables students to choose between an associate of arts and an associate of applied science degree. Most students finish the program within two years, or four semesters, of full-time study. The main difference between the two degrees involves core coursework. Whereas the associate of applied science program requires students to complete 42 credits of core courses, Northeast’s associate of arts program only requires students to complete 32.5 credits of core courses. Notable core courses in both programs include expressive arts; observation, assessment, and guidance; early childhood education curriculum planning; and early childhood administration. All students also complete three field experiences at a school in their local community: a pre-practicum, an infant and toddler practicum, and a preschool and school-age practicum. Located in Brimley, Michigan on the eponymous Bay Mills Indian Reservation, BMCC serves as a tribal college for the Bay Mills Indian Community of Michigan. The college's student body totals approximately 500, including both on-campus and online students. Over half of the student body identifies as Native American and many students hail from local areas. Nevertheless, students around the globe can earn a degree at BMCC, including an early childhood education associate degree online, thanks to distance learning. The college's online early childhood education program delivers all of its coursework asynchronously, without any on-campus requirements, providing maximum flexibility to remote students and enabling them to continue to work full time while enrolled. The program's curriculum emphasizes preparing students for careers in head start centers nationwide. The program's 62–65 credit curriculum includes courses in child development, emergent literacy, developing family partnerships, communication and conflict resolution, and social and emotional needs of children. The program usually requires two years, or four semesters, of full-time study to complete. Differentiating itself from its peers, the program's curriculum also incorporates several courses related to Native American studies, including Ojibwe language, Native American awareness, and the history and organization of Michigan Indian tribes. The college maintains an open enrollment policy, so applicants need only pass a background check, complete a placement test, and submit evidence of a high school diploma or GED. Based in the eponymous city of St. Petersburg, Florida, St. Petersburg College primarily serves the student population in and around Pinellas County. As opposed to a community college, SPC holds the "state college" distinction thanks to the quantity of four-year programs that it offers. In recent years, SPC has expanded the number of degrees it offers online. The college now enrolls a more geographically diverse population and offers an early childhood education associate degree online. The 63-credit online early childhood education program at SPC generally takes two years, or four semesters, of full-time study to complete. Notable core courses include professional techniques for child development, observation and assessment in early childhood, guiding the young child, and developing creative activities for young children. All students in the program also complete an internship at a school in their local community. The program does not require a thesis or capstone. The program delivers all of its coursework asynchronously and does not require students to visit campus in St. Petersburg. Admission requirements involve passing a background check and submitting a high school transcript or GED. SPC offers multiple early childhood education options, as students may seamlessly progress from a certificate program to the associate program or from the associate program to a bachelor's program at SPC. A public university based in Clarion, Clarion University of Pennsylvania originally opened in the 1860s as a seminary and normal school providing teacher preparatory programs. Though the university evolved over the years and now offers programs in various other disciplines, Clarion still receives nationwide renown for its education department. Thanks to the evolution of the university's distance learning capabilities, students can now complete an early childhood education associate degree online at Clarion. Clarion's online early childhood education program delivers all of its coursework asynchronously and never requires students to visit campus for any reason. As such, the program primarily caters to working professionals, and many students choose to enroll part time, taking one or two courses per semester and graduating in four years (or eight semesters). Notable courses in the program include curriculum basis for learning and teaching, exceptionalities in regular class, motor development and learning, and leadership in early childhood education. The program does include a thesis or capstone requirement. Clarion does not list any minimum GPA or standardized test requirements; however, all prospective students must submit evidence of a completed GED or high school diploma. Students who enroll in the early childhood associate program at Clarion can make a seamless transition to the university's early childhood bachelor's program if they remain in good academic standing. Operating four different campuses throughout Duval County, Florida State College at Jacksonville originally opened its doors in the 1960s as a junior college. FSCJ has since earned the "state college" designation by expanding the number of four-year programs it offers. Nevertheless, the college still earns the most acclaim for its two-year associate programs, including an online associate degree in early childhood management. The 60-credit online early childhood education program at FSCJ usually takes two years of full-time study to complete, although some students opt for a part-time track, which takes longer. Aiming to meet the schedule needs of working professionals, the program delivers all of its coursework asynchronously. Notable core courses in the curriculum include program development in early childhood education, special needs in early childhood education, supervised student participation, and observing and recording child behavior. The program's curriculum does not include any capstone, thesis, or in-person requirements. The program does not list any minimum GPA or standardized test admissions requirements; however, all students must take admissions tests specific to the early childhood education program in order to start taking courses. Students interested in a four-year degree can enroll in FSCJ's bachelor's program in early childhood education once they finish the associate program. A community college based in the city of Killeen, Texas, Central Texas College maintains a strong affiliation with Bell County, as many of its students reside nearby. Local students actually founded the college in the mid-1960s. Nevertheless, CTC also focuses on expanding its national -- and even global -- profile. To that end, CTC operates branch campuses in Germany and Italy and offers several of its stronger programs through distance learning, including an early childhood education associate degree online. The 60-credit early childhood education program at CTC typically takes students two years (or four full-time semesters) to complete. Given the broad geographical diversity of its student population, the program delivers coursework asynchronously and does not require students to attend class at set times. The program does not include any on-campus requirements. Notable courses in the curriculum include child guidance, educating young children, children with special needs, the infant and toddler, and creative arts for early childhood. All students also complete an internship as a child care assistant or provider during their final semester in the program. As a community college, CTC operates on an open enrollment policy and does not list minimum GPA or standardized test requirements. All applicants to the program must submit evidence of a high school diploma or a GED and pass a criminal background check. A liberal arts university based in the titular Twin City of St. Paul, Minnesota, Concordia University St. Paul holds affiliate status within the Concordia University System, which consists of eight other universities across the nation. The Concordia System excels in distance learning; CSP is no exception, offering several of its strongest programs online, including an early childhood education associate degree online. The two-year early childhood education associate program at CSP requires students to complete a 64-credit curriculum to graduate. Experienced in online education, CSP strives for flexibility for the working professionals who typically enroll in its programs by delivering all coursework asynchronously and eliminating all in-person requirements. Furthermore, each online course lasts for just seven weeks, allowing students to complete their program at an accelerated pace. Noteworthy courses in the 64-credit curriculum include growth and development of children, children's play and learning, and developmentally appropriate practices in early childhood education. The program does not include a capstone or thesis requirement. All applicants must submit evidence of a minimum 2.0 GPA earned in all previous coursework (high school or college). The program does not require applicants to submit standardized test scores unless the applicant did not attend high school within the past three years. With a main campus in Clovis, New Mexico, Clovis Community College offers a variety of distance learning formats, including interactive two-way television courses, online degrees, and classroom courses at Cannon Air Force Base. Among the school's extensive distance learning offerings is a fully online associate of arts in early childhood education. CCC's online early childhood education program prepares prospective educators to sit for the New Mexico child development certificate. The program also partially fulfills the state's requirements for licensure in early childhood education, birth through third grade. The 71-credit associate degree takes most learners five semesters to complete. CCC also offers an 11-credit certificate of achievement in early childhood education for learners who do not wish to pursue an associate degree. The program begins with 35 credits of core coursework in communication, math, lab science, social and behavioral sciences, and the humanities and fine arts. Early childhood education students then earn the remaining credits by completing courses on major topics, such as current reading and literacy development, engaging curriculum development, and the importance of family and community collaboration. CCC maintains an open enrollment policy, meaning applicants with a high school diploma or GED automatically gain admission and can register for classes almost immediately. The school uses Accuplacer tests to determine the appropriate levels of reading, math, and English courses for new students. Applicants who have taken the SAT or ACT can submit those scores and waive the testing requirement. Every early childhood education associate degree program is different, but there are some common factors that will come up regardless of where you study. Below, you'll find examples of the kinds of courses you might take, and get some idea of how long it will take to complete your degree. These courses usually focus on the development of children during the prenatal, infant, and toddler stages. You will discuss the biological, mental, and social patterns common to these early stages of life, as well as techniques for guiding children and parents toward developmental benchmarks. Courses like this generally focus on children from three to eight years, covering preschool, kindergarten, and the first two or three grades of primary school. You will spend more time discussing pedagogy as well as mental and social developmental benchmarks. This course discusses how to determine if children have a safe environment in which to learn, including health codes, the emotional development of children, bullying, and helping children face issues outside of the classroom. These courses cover the nutritional needs of children to foster healthy eating habits early in life. You will also discuss ways to help children stay active, both in class and after they leave for home. These courses focus on family structures and their impact on child development. You will discuss evolving models of those structures as well as how to help children navigate changes to them, such as divorce, parental incarceration or death, as well as moving or the introduction of new siblings. Accreditation is an important part of the academic process. An accredited school is certified by a national or regional board, meaning that the school has earned the right to award degrees to their students, and meet standards of education. Regional boards accredit public colleges, while national boards accredit private, for-profit, and vocational schools. Neither accreditation is better than the other; the difference is merely one of jurisdiction. Some professional organizations offer accreditation of programs and degrees, known as programmatic accreditation. The National Association for the Education of Young Children (NAEYC) is one such organization, reviewing early childhood programs and offering accreditation to those who meet their standards. While programmatic accreditation like this is not necessary for a quality education, programs with such accreditation offer something extra, and also look better on resumes. The United States Department of Education sets the standards to which accreditation boards hold schools, though regional boards may also enforce standards developed by individual states. The Department of Education also maintains the Database of Accredited Postsecondary Institutions and Programs, which allows users to search for the accreditation of individual schools. The Council for Higher Education Accreditation is a group of over 3,000 degree-granting institutions that advocates for accreditation and the importance of academic standards. They release a number of studies and publications to help inform the public about these issues. The table below offers salary estimates for the field of early childhood education. The table below lists some common positions you to may want to pursue with an online early childhood education degree and the salary expectations for those positions. For each, we have listed the national median salary, as well as those for professionals with less than five years experience, between 5-10 years of experience, and over 20 years of experience. Education careers with greater earning potential than those listed below require more training, but these positions offer a good starting point. Below, you'll find descriptions of and salary information for some of the most common careers available to someone with an early childhood education associate degree. While creative individuals might find ways to apply such a degree in other careers or fields, such as business or publishing, these are some of the jobs for which the degree was designed and for which it prepares students. You can find salary and job growth information in the table below the descriptions. These professionals work with children under the age of 5, helping them learn motor, language, and social skills. Their job is primarily to help prepare children for kindergarten, during which time they will be eased into more rigorous K-12 system. These professionals work under the direct supervision of one or more teachers, offering help in the classroom. Their primary role is to give students additional attention that would take time away from the rest of the class. They might help with specific areas of study such as math or theater. An online associate degree in early childhood education prepares you for undergraduate studies, which in return, will prepare you for more advanced positions. An associate degree is sufficient to serve as a preschool teacher or teacher's assistant, but most states require a four-year degree to teach kindergarten through third grade. Earning an associate degree in early childhood education will allow you to easily transition into a bachelor's program. Early Childhood Education: A bachelor's degree in early childhood education allows you to qualify for jobs as a teacher for children from birth to third grade. These programs represent the most seamless transition for learners who already hold an early childhood education online associate degree from an accredited institution. Elementary Education: Bachelor's programs in elementary education prepare students to teach children in kindergarten through sixth grade. Teacher certification, which is required in most states, is a key component of these programs. Special Education: With a bachelor's degree in special education, you'll be prepared to provide instruction to children, teenagers, and young adults with special needs. Special education professionals may work with children as young as three and adults as old as 21. Library Science: Many individuals with an early childhood education associate degree transfer into library science, where they study to become librarians in a K-12 or community library setting. These programs focus on reading and literacy, along with the use of technology and best practices to help students access information. Joining a professional organization is a good idea even if you are still working on your degree. They can provide networking and job search assistance, continuing education opportunities, and even financial assistance during school. Once you are in the workforce, they can help you to improve your abilities, advance your career, and help others facing similar professional challenges. The four groups detailed below are just a small sample of the organizations you might join. ACEI promotes the development of new solutions to the challenges of childhood education. They advocate for diplomacy to improve the lives of children and expand educational opportunities around the world, and publish two academic journals to help further these goals. Founded in 1987, this organization is focused on the mission of expanding affordable child care throughout the United States. They argue that child care is a basic right, and one to which all parents and children should have access, regardless of income or location. NHSA works to bring educational opportunities to children regardless of the circumstances of their birth. They work with at-risk youth and children in poor communities to help them succeed in school and in life. They support and run programs around the country. The mission of Zero to Three is to help ensure all children have loving, supportive relationships during their formative years. The group supports and maintains a variety of programs around the country to help give parents and educators the tools they need to help infants and toddlers grow. Despite the media reports on the rising costs of higher education, it is possible to earn an affordable early childhood education associate degree. First, students should complete the Free Application for Federal Student Aid (FAFSA) form, which will help you determine if you are eligible for any federal grants, subsidized loans, or work-study support. There are also numerous scholarships available for students looking to enter the early childhood education field, so be sure to check with your program or search online for additional support to finance your education.